“When the last call of the President (Lincoln) was made for 600,000 men, it appeared to the people of this city and county that it would be an impossibility, a hopeless task, to fill our quota of 3,000 men… not only did you succeed in the incredibly short space of six weeks in raising a command from chaos into life and form, bringing together from all quarters the necessary elements and organizing one of the finest bodies of men that ever left this city; but at the same time enabled our county to respond to our country’s call for men without resort to the casualties of the draft. One of the new recruits was Peter DeWein. On September 5, 1864, at the age of 20, he enlisted for one year in the 187th New York Volunteer Infantry. The newly created regiment initially numbered about 600 men. Crisfield Johnson in his Centennial History of Erie County, New York (1876) noted that the regiment, “not being quite full,” did not rate a colonel as its leader, but instead was commanded by Lt. Col. Daniel Myers and Maj. Conrad Sieber. Peter DeWein’s company, Company D, consisted of 80 men from Erie and Cattaraugus counties, most of German descent, commanded by Capt. John C. Beckwith. He, at least, was a veteran. He had enlisted in October of 1862 and was mustered in as a corporal. He saw 14 months of action, until he was wounded in the neck at the battle of Gettysburg. 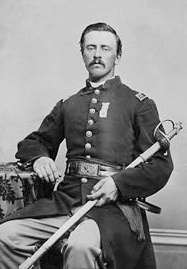 He was promoted to sergeant and then to first lieutenant, but due to his disabilities he was discharged in December, 1863. After recovering his health, he accepted a commission as a recruiter in Buffalo, and enlisted Company D, 187th New York Volunteer Infantry, of which he was appointed captain. He was 23 years old. On October 17th, the first six companies of the 187th regiment left for Virginia. 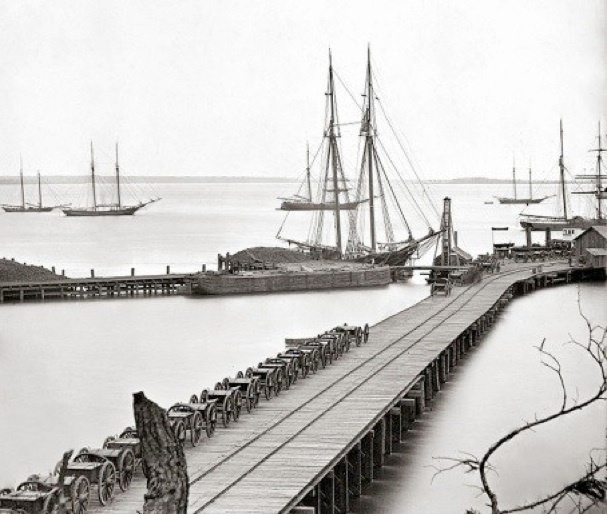 The destination was the outskirts of Petersburg, a city the Union army was attempting to besiege. Vital to the Confederacy, the heavily fortified city protected the road and rail approaches to their capital, Richmond, as well as the supply corridors from the south for Robert E. Lee’s Army of Virginia. 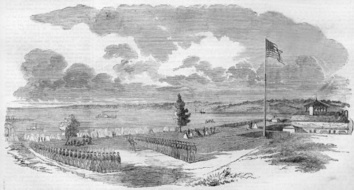 Of the 187th’s approximately 600 recruits “in whose countenances beamed forth the fires of intelligence and patriotism,” many deserted before the regiment reached Virginia – 57 men left with no forwarding address even before the regiment left Buffalo; six more hopped off the train at Syracuse, one at Utica, one at Troy, and eight men vanished into New York City. Army life was apparently not for everyone. “187th N. Y. V. Camp near Poplar Grove, Va.
14 miles from City Point, Oct. 29, 1864. “As you well know, we left Fort Porter (Buffalo), at noon, on the 14th inst., for New York, on our way to the Army of the Potomac. The journey to New York was void of accident, if I except the accident which happened to one of our Captains, who in his anxiety to see that his men were all on (the train car), fell off, and tumbled down an embankment of soft earth some 10 or 12 feet, receiving no further hurt than soiled clothes, and a walk of 5 or 6 miles to the next station. “Of course our boys suffered the usual amount of robbery, from the rascals, big and little who infest the platforms of the different stations where the trains stop. The lovers of the ‘ardent’ suffered most, by sending their canteens and the money to have them filled with whiskey; of course when the train was ready to start, the messengers had not returned. “We arrived in New York (City), at 5 P.M. of the 15th and were immediately marched to Battery Barracks, and after a good supper, our quarters was assigned, when we ‘turned in’ at once, worn out with a ride, the tediousness and disagreeableness of which was only relieved and rendered endurable by the kindness and attention of our gentlemanly Colonel and the officers of his command. Sunday was emphatically a ‘day of rest.’ On Monday our arms and ammunition were issued to us. “Tuesday at 10 A.M. the regiment was formed, and in an hour was on board the steamship Charles Thomas, bound for City Point. [City Point, Virginia, was the headquarters of the Union Army during the siege of Petersburg.] At 3 P.M., we were well ‘under weigh,’ it blowing pretty fresh through the night. The next morning found us rolling about on a nasty kind of a ‘sea.’ That made many of our boys present themselves with pallid faces and retching stomachs to pay their compliments to the Old Sea god. After breakfast, the polls were opened to receive the soldiers votes. There was very little excitement, scarcely half the regiment voting; the rest failing to go up, either from lack of interest, or fearing to trust themselves on their feet until they got their ‘sea legs’ under them. “Friday morning the 22d, we landed and marched to our camping ground; about two miles from the Point, and close to the fortifications. Before night, we had a neat and comfortable camp. It was our first night between canvas walls, but all were in good spirits, and dropped into routine of camp life as readily as though they were ‘vets.’ On Sunday we were inspected by our Colonel. Monday nearly the entire regiment was detailed for work on the fortifications, but was recalled before noon, to prepare for inspection, after which we were to move our camp (to one) just vacated by the l86th N. Y. who had left for the front. “Some of the men complained of being taken from work so soon, as it only lacked half an hour to noon when they would have drawn their whiskey rations; poor fellows, (to have) the prize almost within reach, and then miss it. Disappointment is the lot of all mortals, and soldiers are mighty apt to draw double rations; for after inspection, by the Engineer Brigade Inspector, and moving us to our new ground, congratulating ourselves on the pleasant change of location, our Colonel received orders to be in readiness to move the next morning to the front. “So immediately after breakfast, we broke camp, and marched to Cedar Level Station, three miles from City Point. Taking the train there, in less than an hour we were at Warren Station, on the Weldon Railroad. Here our Colonel reported to Major-General Warren, commanding the 5th Corps, and was ordered to report to Brigadier-General Bartlett, commanding 1st division. We marched about three miles from the Station and camped on a small clearing, made in a thick piece of timber. It looked rather rough at first, but we soon had it in pretty good shape. During the afternoon our Colonel was ordered to report to Brevet Brigadier General Gregory, commanding 2nd Brigade. On the ground, Peter DeWein and his fellow troops – who had been in Virginia for only three days – probably had no idea what role they were to play in the larger picture that day. The 187th’s task, in fact, was solely to occupy some Confederate defenders while other Union forces attempted a flanking maneuver – the real business of the day – in what became known as the battle of Hatcher’s Run. “At this point we moved into the woods to within 400 yards of the enemy’s works. Here we formed in line of battle, the 91st Pa. being the first lines, the 188th N. Y. the second, and ours the third; the lines being about 20 yards apart.—The lines being formed, our men moved forward in good style until within 150 yards of the rebel works, when a heavy and murderous fire from a large body of rebels, that had been laying in a hollow not 50 yards from us, caused us to fall back a short distance, where we reformed, the 91st being thrown out as Skirmishers. “When drawn up in line of Battle we had strict orders not to fire a gun until we had orders to do so. The Old Rigement in front of us, I believe was the 85th pensylvany, they was afraid that our raw troops would hit them. Orders was to move. The old ones marched. We followed behind about 5 rods. At last I found myself in front of a big Tree top and in turning out to pass it, the Balls come from the enemy flying around us all the time. The “Balls” Pvt. Didcock spoke of were minie balls, named for their inventor, Claude Etienne Minié. The most common small arms round in the Civil War, the lead balls were very heavy, and produced large, terrible wounds. If they struck a bone, they shattered it; they also carried dirt and cloth from uniforms into wounds, increasing the likelihood of infection. One of the 187th’s wounded that day was Jacob Cramer. He was 26 years old, had enlisted in Buffalo on October 5th, and was mustered into Company A on October 10th. During the battle, he was hit by a minie ball in his left arm. The arm was amputated, but he died, doubtless from infection, in the army hospital at City Point on November 6th. He was a soldier for just 17 days, and was one of seven of the 187th’s wounded to die in the weeks after the battle. “The next morning, the 28th, we received orders to leave our impromptu works and move to the rear, an order we gladly obeyed, having been 26 hours under fire, and the most of the time exposed to a drenching rain, without shelter, and nothing but hard-tack to eat, as we were not allowed to light fires to boil our coffee. “About 2 o’clock we reached this camp, which is about a mile from the one we occupied before. To-day the boys are busy cleaning their guns and getting ready for another ‘brush’ with the ‘Johnnies.’ We went into the fight with 440 men, and came out with 368–losing in killed, wounded and missing, 72; a severe introduction for a regiment three weeks old. The 187th had a month in camp before its next action in early December, in the Hicksford Raid, also known as Warren’s Raid on the Weldon Railroad, an action to destroy miles of railroad tracks and cut the Confederate supply line into Petersburg. In all, 28,000 men marched south from the Petersburg lines. The 187th was probably not in the thick of the action, as no one from the regiment was wounded or killed. In March and April of 1865, the Army of the Potomac pressed the attack, using its advantage in sheer numbers to wear down the Army of Virginia. The 187th fought again at Hatcher’s Run, at Lewis Farm near Gravelly Run, at White Oak Road, at Five Forks, and at the fall of Petersburg. On April 9th, General Robert E. Lee surrendered at Appomattox Court House. The 187th was present. Only five men of the 187th were wounded in the Appomattox Campaign, and none died. There was another enemy to contend with, however. In less than a year, the 187th lost 32 men to disease, twice as many men as had died in combat. This was the pattern throughout the armies. The Union armies lost more than 35,000 men to diarrhea, 29,000 to typhoid, 14,000 to malaria, 9,000 to dysentery, and more than 7,000 to smallpox. Childhood diseases swept through the camps; measles killed more than 5,000 Union soldiers. But Peter DeWein survived it all. 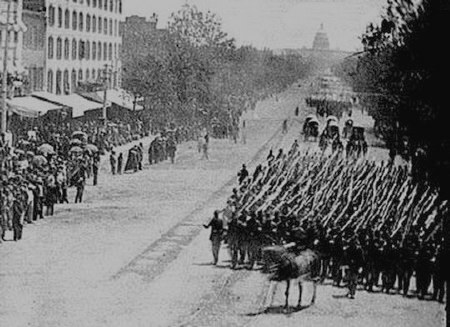 On May 1st, the 187th began its march to Washington, arriving on May 12th. The regiment then marched in the Grand Review on May 23rd, 1865. The weather that day was perfect, the sky cloudless, as Gen. George G. Meade led the Army of the Potomac through the city. Flowers were thrown to the soldiers; people sang patriotic songs. For the first time in six weeks, since Lincoln’s assassination, the American flag few from the top of the staff. 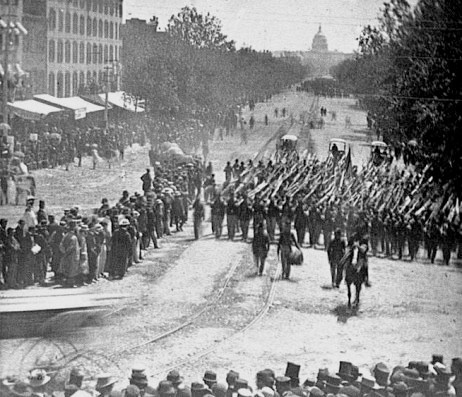 For six hours, a stream of Union troops, their bayonets polished and shining in the sun, marched past President Andrew Johnson and General Ulysses S. Grant in the reviewing stand. 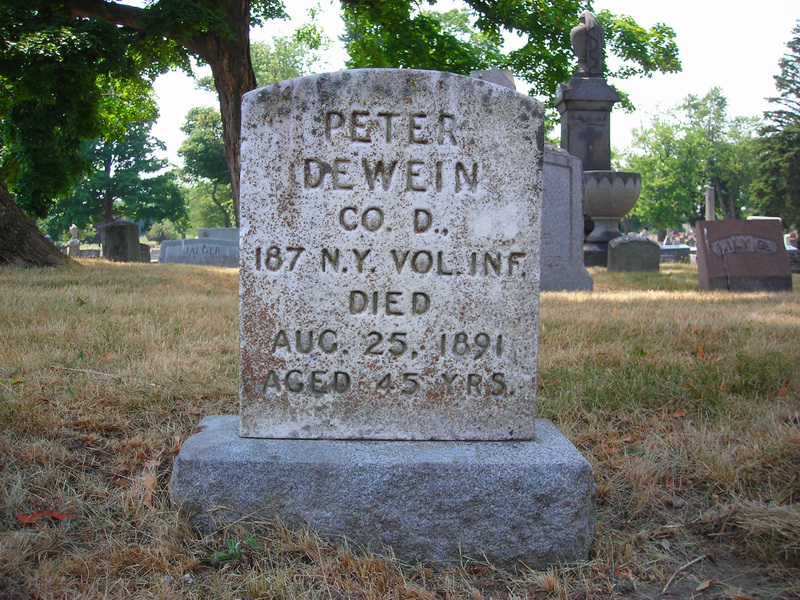 Peter DeWein was mustered out July 1, 1865, at Arlington Heights, Virginia. I don’t know how he got home, but he did. He returned to his occupation as a tinsmith and married Rosina (Rosa) Lang, a young woman who had come over from Germany in 1853 at the age of three. Peter and Rosa had seven children: George, Charles, Phillip, Reika (Ricky), Charlotte (Lottie), Ernestine (Lucy) and Cora. Peter DeWein died in 1891, at the age of 45, less than three years after the birth of his youngest daughter, Cora. His final resting place was St. John’s Lutheran Cemetery at Pine Ridge & Sugar Roads in Cheektowaga, N.Y., just outside of Buffalo. Cora’s daughter, my mother, remembers “going out to the country” to decorate his grave on Memorial Day when she was a child. Thank you for your service, Peter, and thank you for surviving.